New Technology Now Available in d:vote™ 4099 Instrument Microphones for Broadcast and Pro Audio Professionals. DPA Microphones is known throughout the pro audio, broadcast, live production and recording industries for developing small miniature condenser microphones with unrivaled sound quality for various professional environments. At NAB (Booth C336) and with StudioSzene at Musikmesse (Hall 4.1), DPA will be showcasing its recently launched ‘CORE by DPA’ amplifier technology, that powers its line of d:screet™ miniature lavalier, d:fine™ headset and now d:vote™ 4099 Instrument Microphones, to create an even clearer sound by lowering overall distortion and expanding the dynamic range. CORE by DPA has been embraced by users in the broadcast, film, pro audio and theatre world. Sound engineers and designers who know the sonic character of the legacy DPA mics, have taken the new CORE by DPA versions to their hearts. These discriminating users now experience even more natural sound from the miniature-sized microphones. Some even report that they find it hard to distinguish the miniatures’ sound from larger-sized studio mics. At NAB, the new d:vote™ 4099 Instrument Mics with CORE by DPA will be introduced. The award-winning d:vote 4099 Series is one of the most natural-sounding instrument microphone solutions available today. The d:vote™ 4099 line is designed for use with every woodwind and acoustical instrument, the most popular being guitar, violin, cello and trumpet/saxophone. Known for its discreet size and versatile mounting/clip options, the d:vote™ 4099 mic is a great fit for a variety of applications ranging from the studio and theater to live performances during primetime broadcasts. With the new d:vote™, DPA is introducing a new streamlined design that features a more distinguished foam cover that helps decrease vulnerability to wind or movement during a performance. 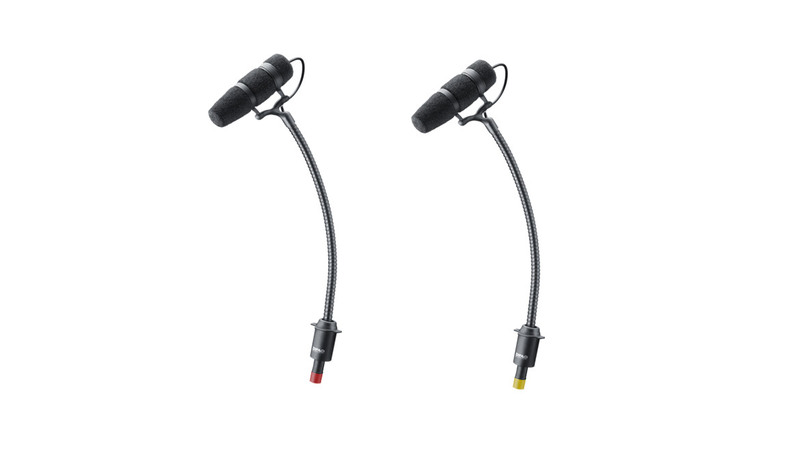 To make it easier for users to tell the difference between the two versions available, the new d:vote mics are color-coded at the bottom of the mic: a red mark represents Loud SPL and a yellow mark represents Extreme SPL. In April, DPA will begin to ship the new d:vote with CORE by DPA mics and discontinue the d:vote legacy versions. Looking to minimize distortion and increase the dynamic range of its d:screet™, d:fine™ and d:vote™ product lines, DPA developed the CORE by DPA amplifier technology to create an even clearer sound from the ‘highest of the highs’ to the ‘lowest of the lows.’ The dynamic range has been expanded in all CORE by DPA capsules. For example, the dynamic range has been increased by up to 14 dB. For the d:vote CORE mics, the dynamic range has gone from 100 dB to 108 dB for the Loud SPL and from 95 dB to 109 dB for the Extreme SPL. CORE by DPA gives the microphones a more clear and open sound across the whole level range. The omnidirectional microphones with CORE by DPA have also achieved an IP58 waterproof rating, which provides water and moisture resistance through nano coating and hermetic sealing of the sensitive electronics. Microphones purchased with the technology will come in CORE by DPA packaging and will feature a blue label (d:screet™ and d:fine™) or blue ring (d:vote™) to differentiate between these and the legacy versions. A very discreet laser engraving stating ‘core’ has been incorporated on the microphone capsule as well for the d:fine™ and d:screet™ versions.